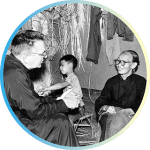 when four Maryknoll priests left for China and began a legacy of witness that now touches the world. Fr. Thomas F. Price (Maryknoll co-founder), Fr. James E. Walsh, Fr. Francis X. Ford and Fr. Bernard F. Meyer departed for China on Sept. 7, 1918. 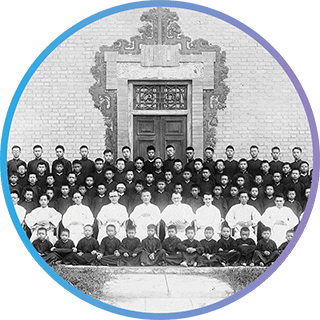 China has played a unique role in the history of Maryknoll — our first roots were planted in Chinese soil, and many of Maryknoll’s cherished charisms and traditions were nurtured there. 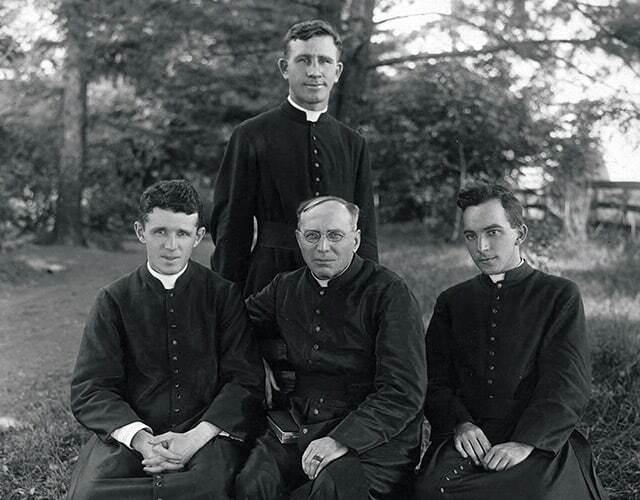 The faith of these four priests would serve as inspiration for the thousands of men who followed them, partnering with local churches for the past 100 years to bring compassion, relief, and the message of God’s love to the poor on the fringes of society. 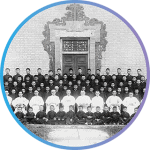 Maryknoll Fathers and Brothers still serve in China primarily as teachers and in pastoral settings. 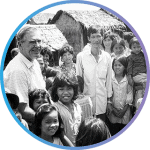 In other parts of Asia, Maryknoll missioners are advocates for migrant workers, children, and abused women. In parts of Africa, Maryknollers are tireless in caring for people displaced by civil war, and challenged by food shortages and water scarcity. At the same time, they are offering Mass and the sacraments in growing parishes, and training lay leaders. 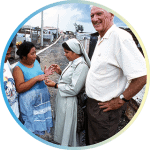 In Latin America, Maryknoll has become a hopeful presence in schools, parishes, and prisons. Our language school and center of learning in Bolivia attracts priests, religious, and lay missioners and others from all over the world. 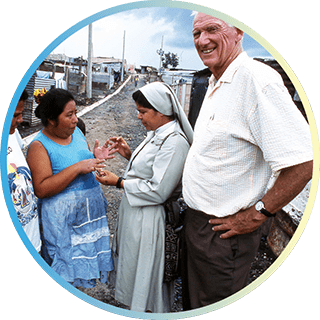 Maryknollers now serve in more than 20 countries across Asia, Africa, Latin America and the United States, witnessing the Gospel and advocating on behalf of the poor, the suffering, and the marginalized. Sorry, these celebrations are private and NOT open to the public. 1990: On April 14, 1990, Father Thomas Dunleavy, M.M. concelebrated Mass in the National Theatre of Phnom Penh with an estimated 2,000 Cambodian Christians in attendance. The Easter observance marked the first public display of Christian worship since 1975 when the Khmer Rouge took over Cambodia and expelled all foreign missioners. 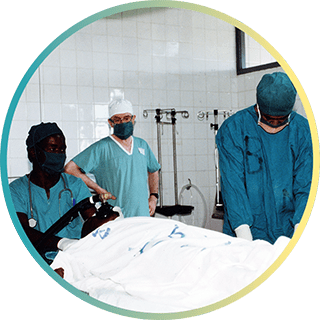 2000: Never before had the Catholic Church teamed up with an African government and a U.S. medical school to create a medical school in a developing nation. Thanks to Maryknoll’s trusted relationship with each team member, Maryknoll Father Peter LeJacq’s alma mater, Weill Cornell Medical College and New York Presbyterian Hospital became the legal Affiliates of Weill Bugando Medical School and Bugando Medical Center, each owned and led by the Tanzanian Catholic Church. 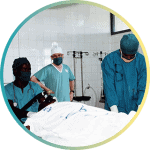 Since the first graduation in 2008, these Tanzanian MD’s have remained in Tanzania and significantly improved the previous ratio of only one M.D. for every 45,000 Tanzanians. That is a modern sign of Christ’s love and care of the sick-poor. 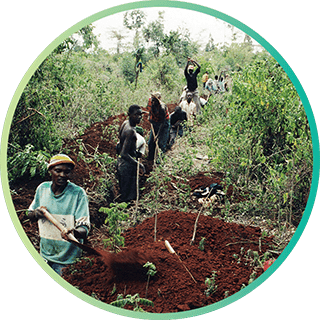 2002: Coffee farmers in Kiganjo, Kenya, completed an eight-mile-long pipeline with sheer determination—digging by hand—and the support of Maryknoll donors and Father John Lange, M.M. The pipeline created enough income to educate their children, and deliver water to nearly 3,000 people in a nearby farming community. 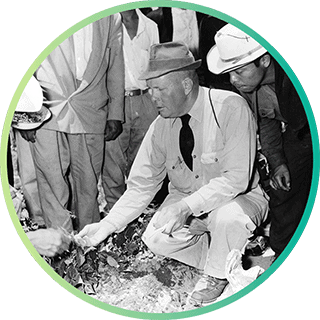 1963: The 30,000 farmers of Huehuetenango, Guatemala could not grow enough corn to feed their families. 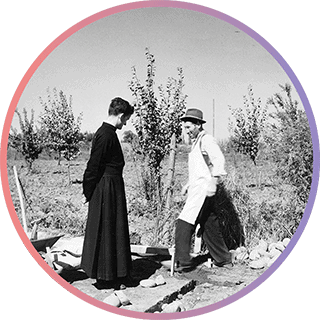 Maryknoll Brothers Felix Fournier and Carl Puls experimented to increase the corn yield per acre and produce a better strain of corn. With technical help from the Guatemalan government, the Brothers discovered the most effective fertilizers and insecticides for local conditions. When enough farmers began using them, the Brothers formed a cooperative for seed and fertilizer lending, which is paid back at harvest time. 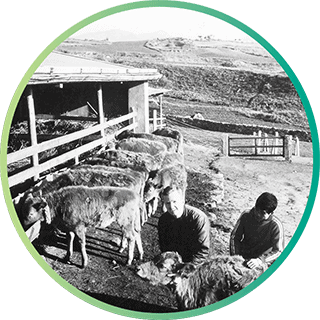 1969: Breeding cattle for beef production was little known in South Korea. Father Clyde Davis, M.M., a transplanted cowboy from Oklahoma, believed that the mountains in Kew Sun Kun were capable of raising small herds of cattle. Almost all the feed needed for 30-50 head could be grown on the low-lying mountains that had good natural grass cover. Through an existing credit union in his parish, Father Clyde formed a cooperative of cattle farmers. Community support spread rapidly and a new industry was born. 1978: Father Rafael Dávila, M.M. 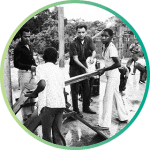 assisted local leaders in their many community projects. 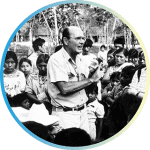 He directed a human development project in a remote jungle village of Venezuela’s tropical rain forest. Expanded agriculture and new industry were the two main goals. Other program areas included medical care, pre-school classes, physical well-being, and community lifestyle. 1959: In a city of 50,000 people, Father Wilbur Borer, M.M. 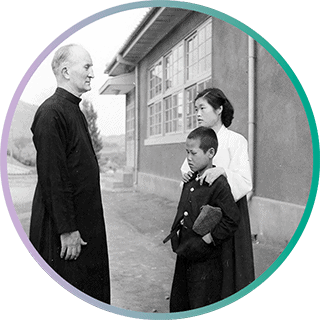 began the only Catholic institution of its kind in Chungju, South Korea: a newly constructed school for the training of blind or deaf children. 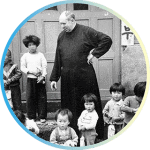 Father Wilbur then constructed a hostel where the children lived. 1967: The obstacles were staggering in Peru: illiteracy, addictions, and poor diet as well as no facility in the dominant Spanish language. Maryknoll Father Robert Kearns responded with radio schools. The Puno indigenous people learned to read and write, built their technical skills, and benefited from improved healthcare. 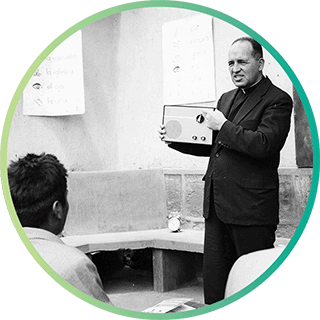 From a powerful transmitter, Father Bob beamed his classes throughout the province. 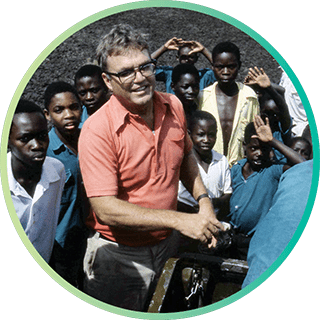 2017: Through the Tunaweza (“We Are Able”) program in Mwanza, Tanzania, Brother Loren Beaudry, M.M. helps young adults with learning disabilities become self-sufficient. They learn to wash, cook, garden, sew and to read and write in Kiswahili. They also study math and receive speech therapy. 1960: Father William McCarthy, M.M. became pastor of Peru’s newest parish in the “City of God.” This tent city on the outskirts of Lima housed an army of squatters for years. When Father William became pastor, he discovered over 100 cases of tuberculosis among just 57 families. Many people lived without electricity and very little clean water. His relief efforts brought donated food and clothing into the tent city. 1977: Father Joseph Thaler, M.M. began his mission life in the Philippines where he matched high school students with prisoners from a penal colony. Together they built a dormitory for the Atae people whose land was exploited by lumber companies. 1978: To address severe water shortages for people living near Lake Victoria in Tanzania, Father James Conard, M.M. introduced windmills in the 1970’s to pump water to surrounding communities for irrigation. 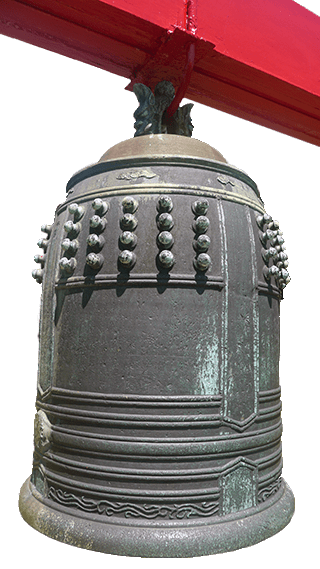 Then he introduced grinding mills for grain, which were owned by the parish and helped support parish activities. 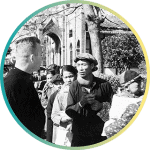 1960: Following deadly torrential floods, Taiwan began to rebuild with the help of 49 Maryknoll priests. Father William J. Richardson, M.M. recollects: “We knew the survivors didn’t have the means to cook, so we got a troop of bakers to turn the flour and rice into buns. Then we motorcycled the buns to each center, on the basis of two buns per person, each day.” This kept stomachs more or less filled until other supplies were helicoptered in. In a two-week period, Maryknollers fed and assisted 250,000 flood victims. 1973: Nicaragua’s first permanent housing community for the poor after the devastating Christmas earthquake of 1972 came out of the ground of an old cotton field. Father Miguel D’Escoto, M.M. gave priority housing to the working poor whose homes were destroyed. Each new resident was chosen on the basis of commitment to the creation of a new community, and the ability to contribute to its well-being. 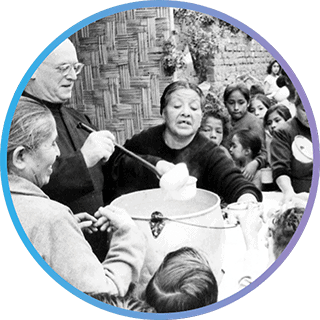 2000: With help from a team of Maryknollers and overwhelming donor support, Father William Donnelly, M.M. 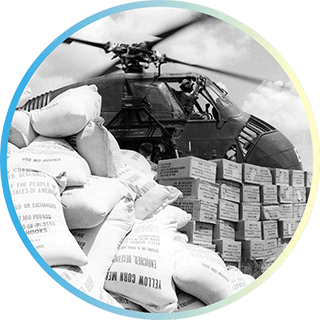 provided emergency relief to the victims of hurricane Mitch that devastated Central America in 1998. 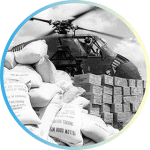 They distributed hundreds of mattresses, kerosene stoves, kitchen utensils, and foodstuffs such as rice and sugar. Catechists applied new skills, going door-to-door rebuilding homes while also sharing moments in prayer. 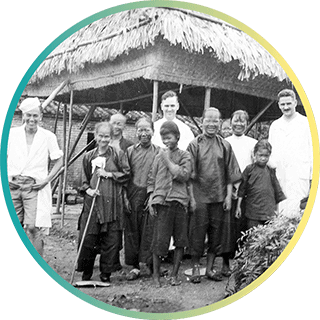 1943: Maryknoll’s leper colony in South China received over $94,000 in support from United China Relief, the British Embassy, and the Red Cross to help prevent and treat epidemics of dysentery and malaria. At that time, China was suffering from one of the worst famines to strike the country. 1953: Goiter affected one out of five people in Tienchung, Taiwan, a near epidemic. Father James T. Manning, M.M. and Father Francis O’Neill, M.M. 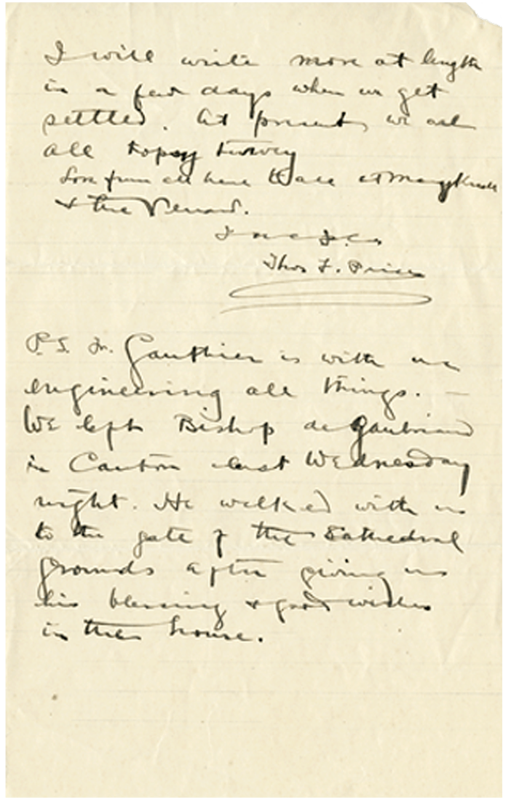 persuaded the U.S. Navy to send a bacteriologist to survey the prevalence of the disease. As a result, a regularly scheduled program began. Within a short time, over 4,000 people found treatment every week at the Catholic mission in Tienchung. 1987: Father Joseph Sweeney, M.M. was known as “Big Joe,” the Maryknoller with a big heart. He served the leper community in South China for many years, beginning in the 1930’s where he built a model leper colony called Gate of Heaven. The war disrupted his mission. But after several years, Father Joe went to Korea where he served at St. Lazarus Leprosarium in Seoul. In 1962 he was awarded the Order of Merit by the South Korean government. 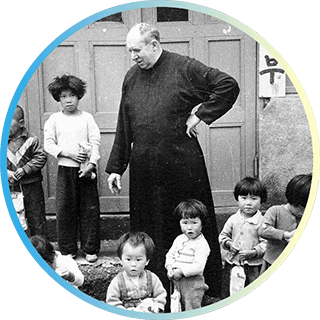 1920’s-1930’s: From the earliest days of Maryknoll in China, Father Francis Ford, M.M. was one of the driving forces in the opening of seminaries for native priests and novitiates for a native sisterhood. After several years of foundational work, Father Francis opened the Little Flower Preparatory Seminary in Pakkai in 1926 and Maryknoll’s regional seminary in Hong Kong in 1933. 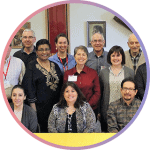 1990-present: Maryknoll is committed to forming and supporting frontline parish personnel as representatives of the Catholic Church in the U.S. to become mission educators, ready to inspire others to fulfill their call to mission. 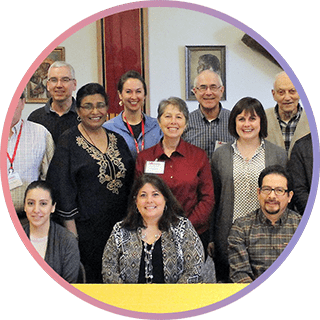 Our key audiences are teachers and catechists, deacons, leaders in the Hispanic community, and young adults who are passionate about social justice and who are also committed to ending social and economic inequality. 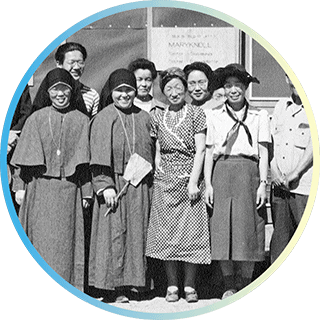 1942-1944: During World War II, at the request of local bishops in five American states, the Maryknoll Society sent its Fathers and Brothers to minister to Japanese and Japanese Americans living in government-run relocation camps. Along with his fellow missioners, Father Hugh Lavery, M.M. offered support and consolation to those who were forcibly removed from their homes along the U.S. Pacific coast. 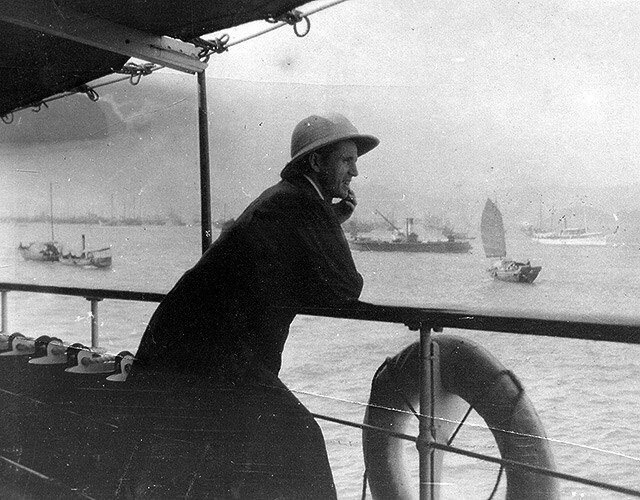 1958: For years after the Communist takeover of China in 1949, refugees poured into Hong Kong. Father Howard Trube, M.M. lived and served among them and became known as the “Pastor of Mud Alley.” His first missions included a community center with a chapel, and emergency care for families dealing with tuberculosis, diphtheria, and other life-threatening diseases. 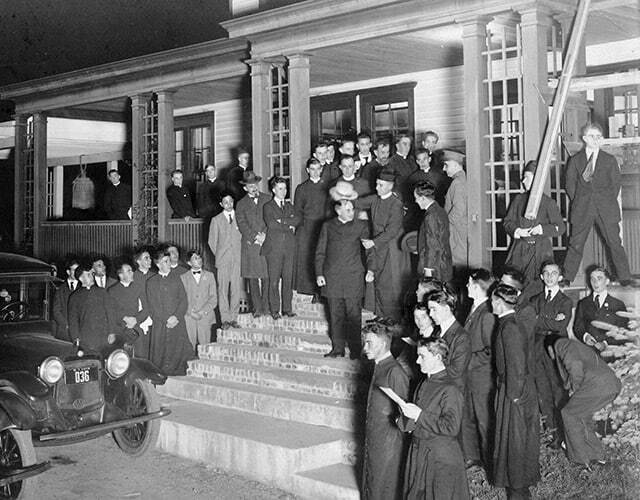 Eventually, Father Howard built a school for six grades and some 500 students. 1984: Brother Martin Shea, M.M. 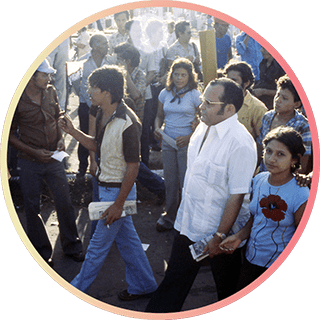 became known as a “Vagabond of the World” for his work with Guatemalan refugees living in Mexico—being present to the people, walking with them, suffering with them. Many Guatemalans left their homes because of the army massacres of the Mayan Indians during the 1980s. 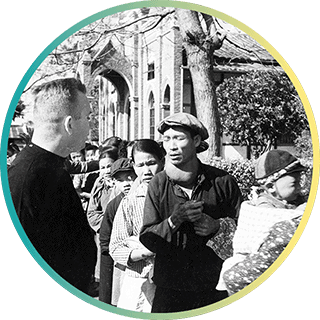 While witnessing the compassion of Our Lord, Brother Martin lived in desperate conditions but never left the people he came to serve. 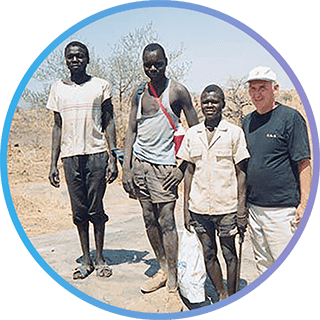 1990: After strenuous efforts to practice and share their faith, Maryknoll Fathers Richard Baker, Thomas Tiscornia, and William T. Knipe were forbidden from doing any public church work in Sudan, including praying or even celebrating Christmas Mass in a private home. Acts of violence became common. In one parish, a grass school and church were set ablaze by the police. 1959: Founded by Father James McNiff, M.M., Maryknoll’s Agricultural School for Boys in Chile educated poor boys from the fondos, or large farms, in the rudiments of formal education, trained them for work on the farms, and offered pastoral care for those seeking to practice their faith more fully. The school gave students a chance for a more stable future. 1995: Three Maryknollers—Father Thomas Dunleavy, Father William O’Leary, and Father Charles Robak—served at a job training center in Nam Ha province outside Hanoi, Vietnam during the 1990’s. The students took six-month courses in tailoring and carpentry. 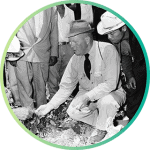 The missioners also helped train farmers and organized a credit union for the flower-growing industry. 1996: In addition to his pastoral duties at two parishes, Father Edmund Cookson, M.M. 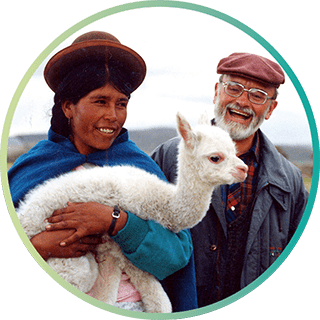 helped the Aymaran people in Peru start several farm development projects. 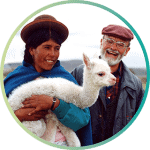 Pastoral teams ran an alpaca project involving over 1,000 families as well as chicken- and guinea-pig raising. 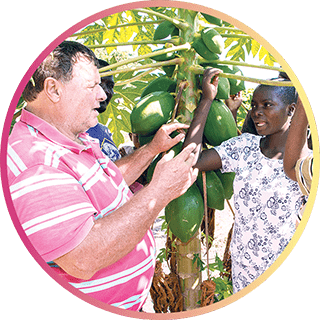 Father Ed also helped the Aymarans build adobe greenhouses so they could raise vegetables year-round and improve their diets. Here we are at last all of us—safe & sound & happy. 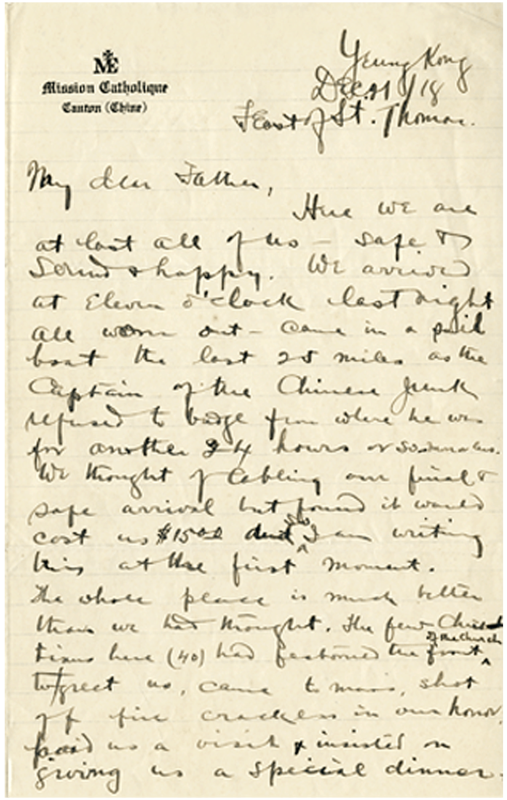 We arrived at eleven o’clock last night all worn out—came in a sail boat the last 25 miles as the Captain of the Chinese junk refused to budge from where he was for another 24 hours or so—more or less. We thought of cabling our final and safe arrival but found it would cost us $15.00 and so I am writing this at the first moment. The whole place is much better than we had thought. The few Christians here (40) had festooned the front of the church to greet us, came to mass, shot off fire crackers in our honor, paid us a visit & insisted on giving us a special dinner. I will write more at length in a few days when we get settled. At present, we are all topsy turvey. Love from all here to all at Maryknoll & the Venard. P.S. Fr. Gauthier is with us engineering all things. We left Bishop de Guẻbriant in Canton last Wednesday night. He walked with us to the gate of the cathedral grounds after giving us his blessing & good wishes in the house.